Lauren Singer is a 25 year-old graduate from New York University who studied Environmental studies. Three years ago, she decided to begin living a waste free life. This meant that she would do everything she could to avoid generating trash. She did this in a variety of ways including avoiding buying prepackaged food, and not purchasing items that came in wasteful containers such as toothpaste or lotions. This meant two things: One, that she had to completely change her diet, and two, that she had to begin making the things she used to purchase in plastic packaging. In a TED Talk Singer gave, she described these changes. She said that she began buying fruits and vegetables, as well as bringing her own glass jars to the market to fill with grains, nuts, etc. 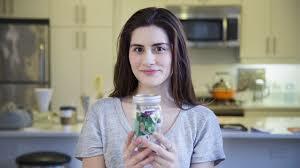 She also began making her own beauty products including toothpaste, soap, and deodorant. Now, after three years, the amount of trash that Singer has created can fit into one mason jar. Singer is a fantastic role model for anyone interested in sustainability or living a waste free life. And her blog is an amazing resource, providing sustainability tips and tricks for beginners. For anyone looking for some eco-friendly inspiration, or a sustainable role model, look no further than Lauren Singer!